For more information or to sign up for a boat or shuttling on a paddle, just contact us. Click through and bookmark the PaddleBR Calendar page for an at-a-glance look at anything coming up in the next month, or through the magic of Google Calendar, add the PaddleBR Events calendar directly to your app or account. Launching: Bayou Fountain at Highland Road Park, 8am. Recovering: Highland Road Park, early afternoon or so. Mission: We’re out on Bayou Fountain most weekends doing normal paddle trail maintenance and cleanup. If you want to join us, have a guided trip, or borrow a boat, just get in touch. Just updated the schedule. 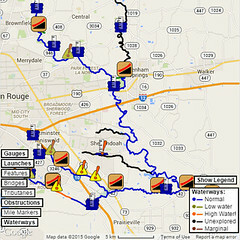 Looks like Mike’s going to be out hiking this Saturday, but I’m planning to be on the bayou heading downstream at 8am. Hopefully it’ll be a shorter day (sandwiched between the end of #11’s set and the start of #15’s insanity) — being back in time for the Saints game sounds good to me, as *my* native home team just lost to those infernal 49ers. where do i go to get a canoe one weekend?